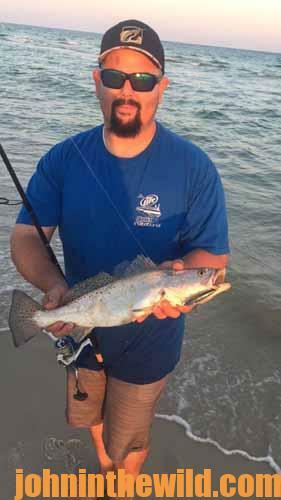 Editor’s Note: Dustin Hayes of Orange Beach, Alabama, is a master inshore fisherman. He guides families and individuals surf fishing and night fishing under dock lights in the back bays. 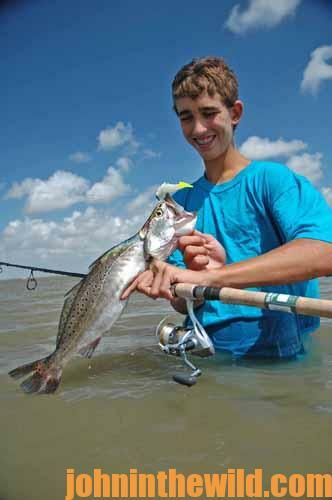 During the daytime, he takes them fishing on the grass flats and artificial reefs. Hayes knows how to catch inshore fish near and on beaches, and his tactics will work for you. 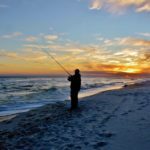 You can fish anywhere on the beach, and you don’t even have to get your feet wet, but some places are more productive than others. For instance, on a clear day when the water is clear, you’ll often see sandbars that are 20-30 yards off the beach. In-between the sandbar and the beach, the water is deeper than the water on the sandbar or near the beach. These places are often called cuts, and baitfish easily can swim over the sandbar and move into those deeper cuts between the sandbar and the beach. If large predator fish start chasing the baitfish, the baitfish can just move into shallower water closer to the beach. 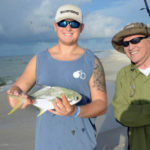 On the high tide, prey fish like pompano, Spanish mackerel, redfish, speckled trout, flounder, bluefish and ladyfish can move over the sandbar and swim up and down these cuts, eating baitfish. So, any time you fish between the beach and a sandbar in one of these cuts, you’ll often find better fishing and catch bigger fish than you will in ankle-deep water. Those cuts may run extremely close to the beach. You often don’t have to make long casts to reach these cuts. The surf rig or pompano rig with the pyramid-type sinkers are designed for fishing these types of places. But any time you find deep water that may mean a 2-3 foot or more bottom close to the beach, you’ll have an ideal place to surf fish. 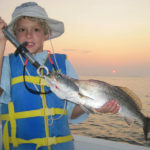 Another advantage that surf fishing provides, especially for families with children, is the children can catch the bait with which you fish. 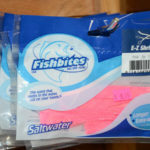 These baits are primarily sand fleas and ghost shrimp. You can buy an inexpensive sand flea rake. Just as the waves break and come in, you can see where the sand fleas are concentrating and use the rake to scoop up the sand and sift the sand fleas from the sand with your sand flea rake. 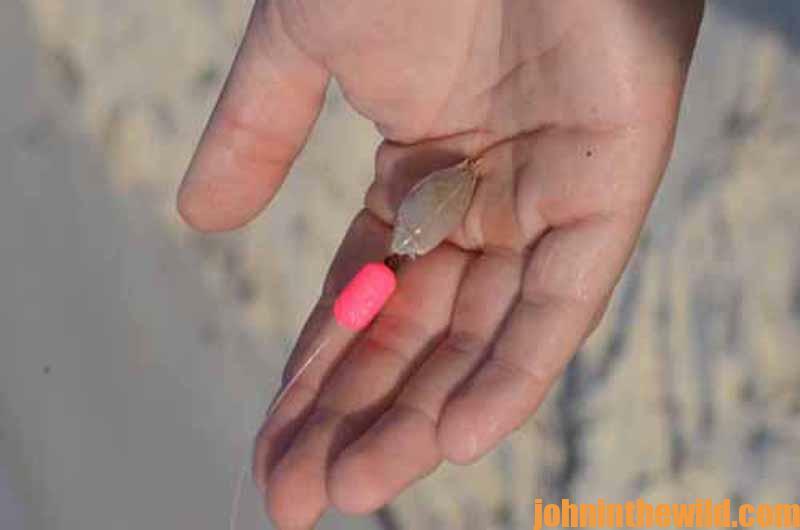 A productive bait for surf fishing is a small type of shrimp known as a ghost shrimp. To catch them, you can purchase an inexpensive ghost shrimp pump. When the waves break on the beach, the ghost shrimp make little holes in the sand in ankle-deep water. Using a ghost shrimp pump, you can pump the ghost shrimp out of the holes and use them for bait. We have discovered that youngsters often have more fun catching sand fleas and ghost shrimp than they do fishing. The older children, Mom and Dad can catch fish in the surf, while the youngsters are catching bait. In the Orange Beach, Alabama, area, visit Top Gun Tackle (http://www.topguntackle.com) for sand flea rakes and ghost shrimp rakes. 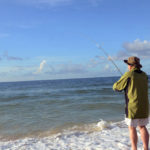 To see how, where and with what Dustin Hayes fishes, check out his video, “Speckled Trout in the Surf:” https://www.youtube.com/watch?v=-P215WB0_kc. 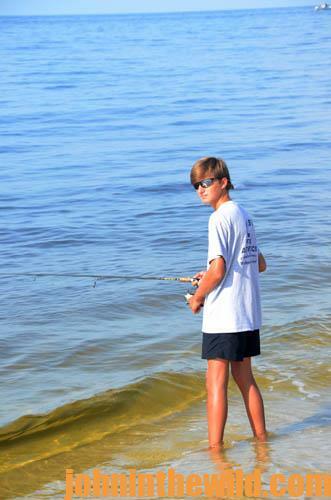 If you’d like to go on a surf-fishing trip with him, call at 251-981-3811 or his mobile at 678-897-0167. You can check out his Facebook page and see what his clients are catching at https://www.facebook.com/Shorethingfishing. 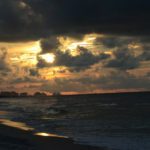 To learn more about saltwater fishing, check out John E. Phillips’ Kindle eBooks and some print books at http://johninthewild.com/books/#gulf.